The Brooklyn Bridge, originally referred as the Great East River Bridge connects the burroughs of Manhattan and Brooklyn. The bridge was considered as the largest bridge of its era. The project was built by a German immigrant, John Roebling who used to work for the Prussian government as a famous bridge designer. He proposed the idea of constructing a suspension bridge after becoming impatient with the Ferry he used to take to cross the river. Initially, the project of Great East River Bridge was not supported by the government of New York and Brooklyn. But later on the bill was passed in New York Legislature that allowed a private company to build the bridge between Brooklyn and Manhattan. The work started in 1869 and it took 14 years to complete. Six hundred workers were involved in the construction of the bridge. John Roebling, the designer of this scenic passage died before its completion. There were enormous problems during the construction. Many workers lost their lives due to explosions, fires, and caisson’s disease. Washington Roebling, son of John Roebling took the charge of the construction work after his death. 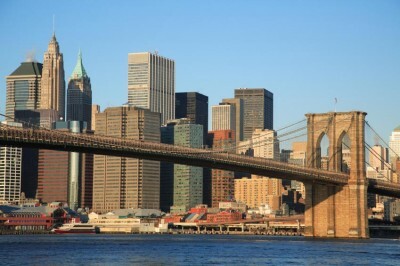 On May 24, 1883, the Brooklyn Bridge was officially opened to the public. The Brooklyn Bridge is considered one of the technical achievements of unparalleled scope. The bridge is 1.8 km or 5989 ft long and the length between the towers is 486 meters. The 276 ft neo-Gothic granite towers provide support to the rail lines and these strong towers can withstand heavy rains and strong winds. The towers served the function of bearing the weight of enormous cables and holding the cables high enough so that it would not interfere with the traffic. Steel was used for the first time in making the four suspension cables. These steel cables connect the anchors with the Brooklyn and Manhattan towers. The load capacity of the bridge is 18,700 tons. Two terminal buildings consisting of plate glass windows and ornate ironwork were constructed at both ends of the Brooklyn Bridge. 70 electric arc lamps were installed throughout the extension of bridge. There is an elevated pedestrian path where traffic does not interfere. The total cost of this spectacular bridge was $15.1 million. In 1964, this iconic structure became a National Historic monument. The view of downtown Manhattan’s skyline is spectacular. This piece of marvelous beauty looks great when viewed from the river. The overall arc of the bridge is impressive when seen from the river. During the night time, the experience of strolling under the glow of electric arc lamps is fabulous. Today, this granite and steel structure of the New York City carries approximately 150,000 pedestrians and vehicles every day. There are more than six lanes of traffic. South Street Seaport is located on the Manhattan side of the Bridge. Despite the tragic deaths and injuries during the construction of the bridge, the completion of the bridge was a heroic achievement by the workers. Brooklyn Bridge is a testament to the ability, strength and courage of the men who built this historic icon.